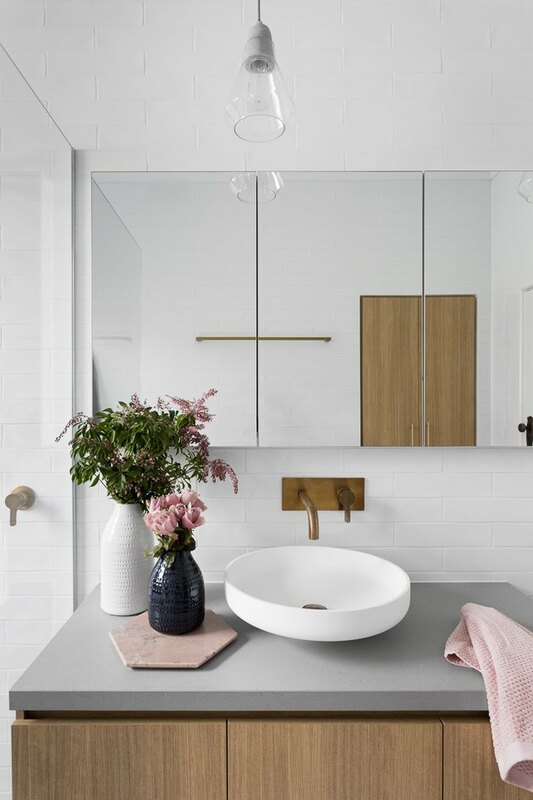 Dreamy bathrooms come in a variety of shapes, colors, and sizes — ranging from monochromatic white, to Scandinavian minimalism, to midcentury modern, to rustic farmhouse. Whichever style speaks to you, wait until you see it in gray. 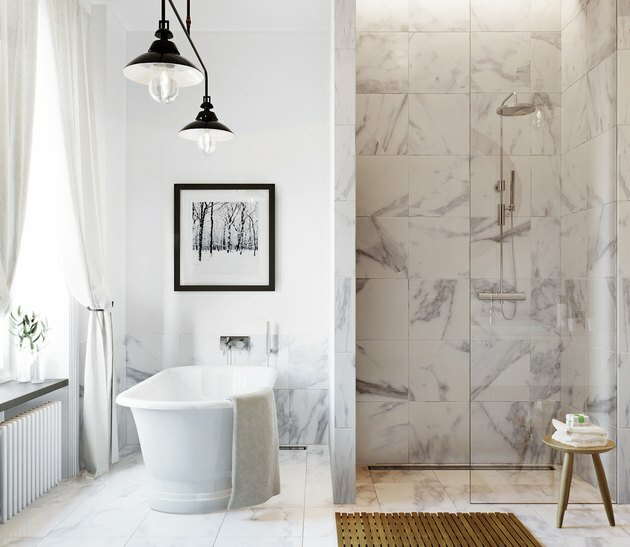 The beauty of a gray bathroom is that depending on the shade of gray, the amount used, and the lighting, the mood in your bath can change dramatically. Whether it's ethereal in the morning or dramatic at night, when it comes to bathrooms, we love all of the vast and beautiful shades of gray. However, here are 13 dreamy gray ideas for your loo that we just can't stop obsessing over. 1. The beauty lies in the gray details. We just love all of the little gray details in this bright bathroom redux by The Leslie Style. From the stripes on the walls, to the hexagon mosaic tile on the floor, the contrast between gray and white really makes this bathroom pop, and adds subtle yet playful dimension. 2. Rustic gray minimalism is very chic. This bathroom is the epitome of rustic minimalism. 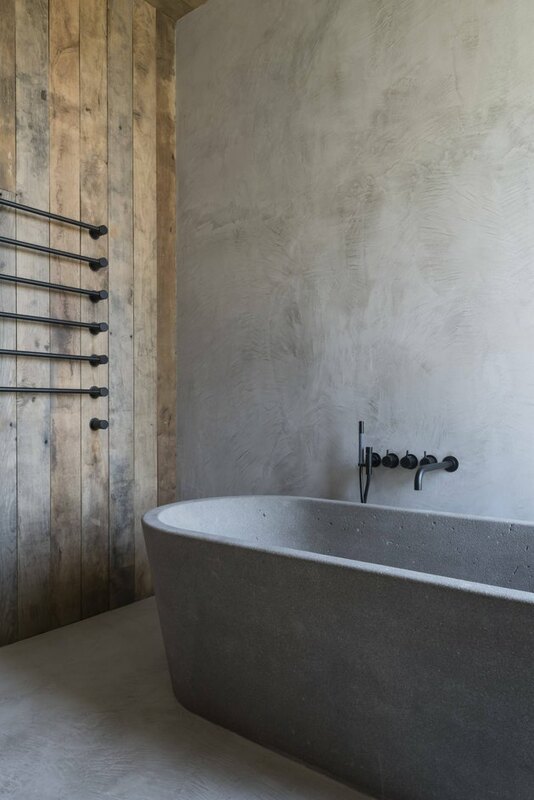 Inspired by the Arte Povera movement — which used natural materials such as driftwood, concrete, and metal — designer Vincent Van Duysen incorporated the same earthy gray elements into this pared down bath. The contrast of rough wood and concrete blended with modern black fixtures, creates a stunning textural atmosphere that we adore. 3. Add an edgy pop of gray to your bath with a bold concrete sink. Perth-based creative duo Matt and Kim Di Costa understand that sometimes less is more. They chose a more subtle approach to their luxurious gray bathroom, and we approve! The insanely beautiful concrete trough sink by Nood Co., really complements the gray veining of the marble wall tile. 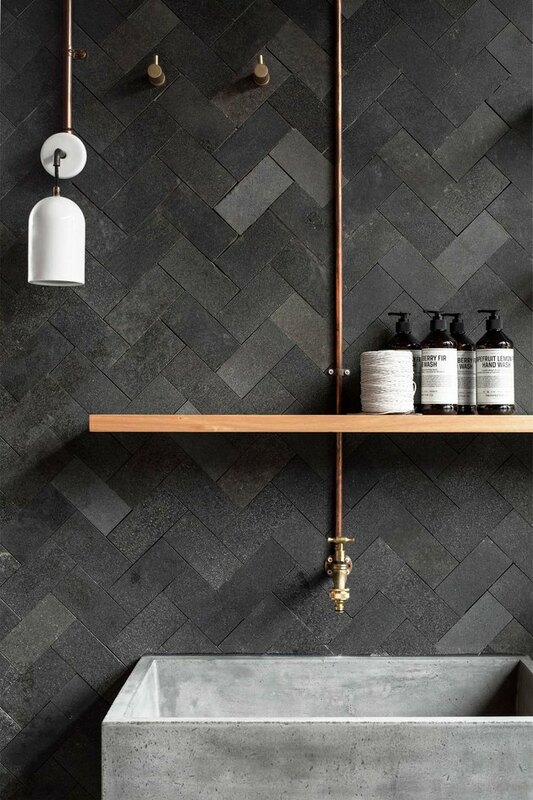 The striking matte black fixtures tie the whole space together in one lovely package. 4. Complement your cool gray space with warm metal finishes. You can thank the talented team at Golden for this eye-catching gray bathroom. They paired bold natural stone with dark stained timber and burnished brass fixtures to create a moody palette that radiates cool sophistication. 5. Industrial textures blend beautifully. 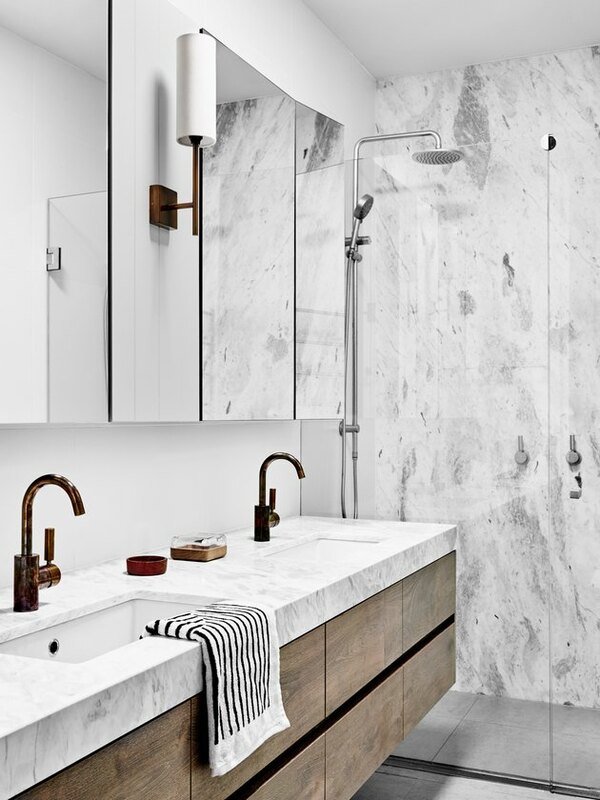 We are swooning over this industrial chic bathroom designed by Melbourne-based Pipkorn & Kilpatrick. The layers of raw materials are woven together to form a striking tapestry that transports you to a cottage in the countryside. The herringbone bluestone pavers, concrete trough sink, floating wood shelves, exposed pipework, and brass fittings all work together to make this rustic bath feel warm and cozy. 6. Light gray and white are a match made in heaven. This bathroom's transformation, courtesy of Square Footage Inc., is an absolute hit. 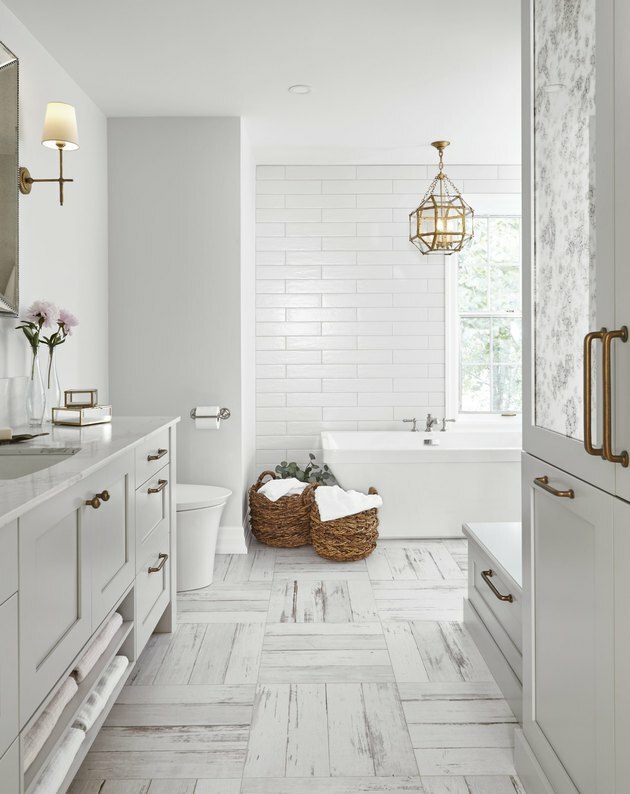 The light gray and white color palette really brightens and opens up the space, while the crosshatch floor tiles, antique mirror, warm brass fixtures and hardware warm things up, striking a picture perfect balance. 7. Gray countertops are oh, so dreamy. If you can only add one gray element to your bathroom, this little number makes a strong case for considering the countertop. Centrally located, this small change can completely overhaul the look and feel of your vanity, not to mention the vibe of your entire bath. Pair with warm wood and millennial pink to recreate this harmonious design. 8. Warm up those concrete walls with a little wood flourish. 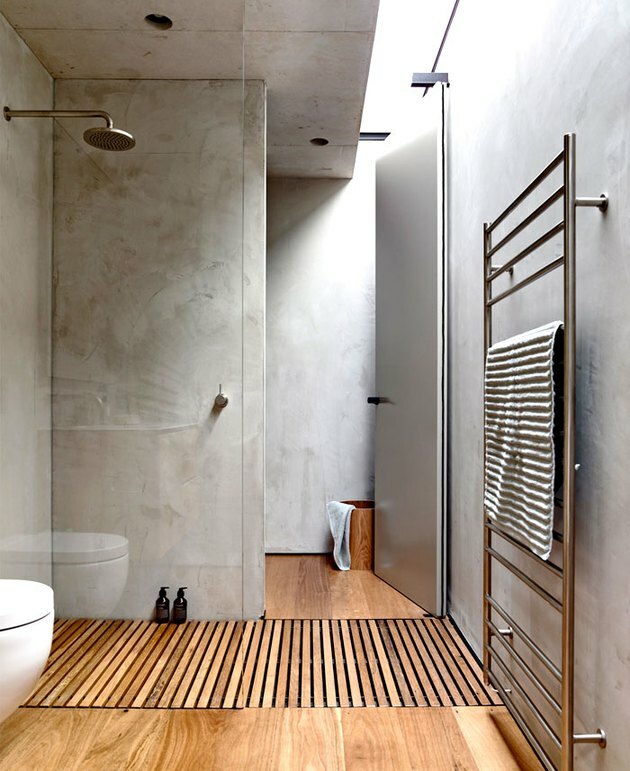 Concrete walls and wood floors, what's not to love? The play between textures and the contrast between warm and cold is simply beautiful. 9. Don't underestimate the dynamic power of gray mosaic tile. Designed by Carter Williamson, this bathroom covered in floor-to-ceiling marble mosaic tile is the definition of decadence. The luxurious fish scale shape is a breath of fresh air that washes this gray-tiled room in unique sophistication. 10. Make a statement with a gray tile accent wall. Reminiscent of a luxury hotel ensuite, this masculine floor-to-ceiling tile accent wall makes a bold statement. 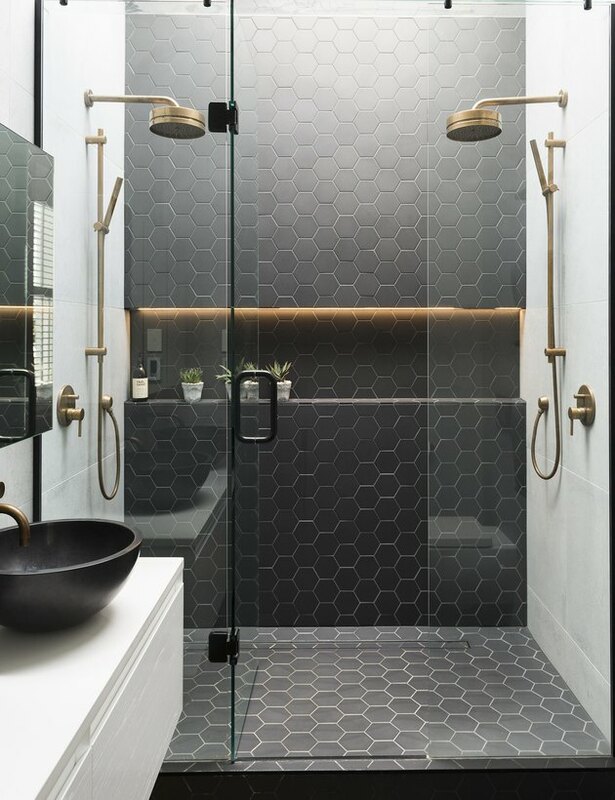 The dark gray hexagon tiles are complemented by warm brass fixtures resulting in a handsome bathroom design perfect for any distinguished bachelor pad. 11. Marble tile with gray veining is a timeless classic. If you love the natural veining found in marble, then Carrara marble tile is an ideal way to incorporate gray hues into your bathroom. 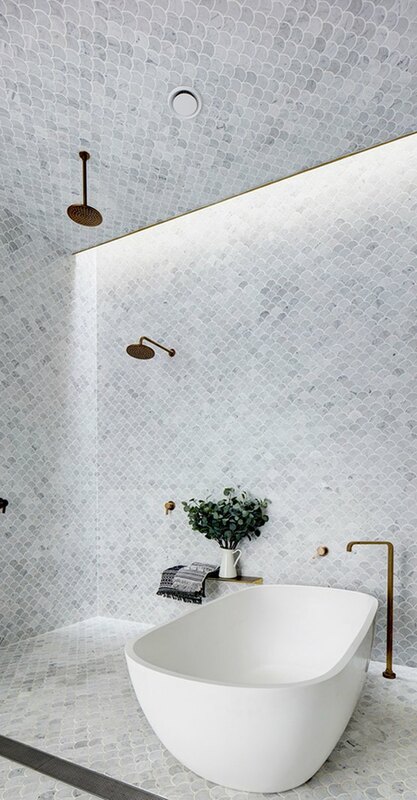 This glamorous bath decked out in the sumptuous stone is a perfect example of why marble has rightfully garnered the reputation of being a timeless classic. 12. A coat of gray paint can do wonders. 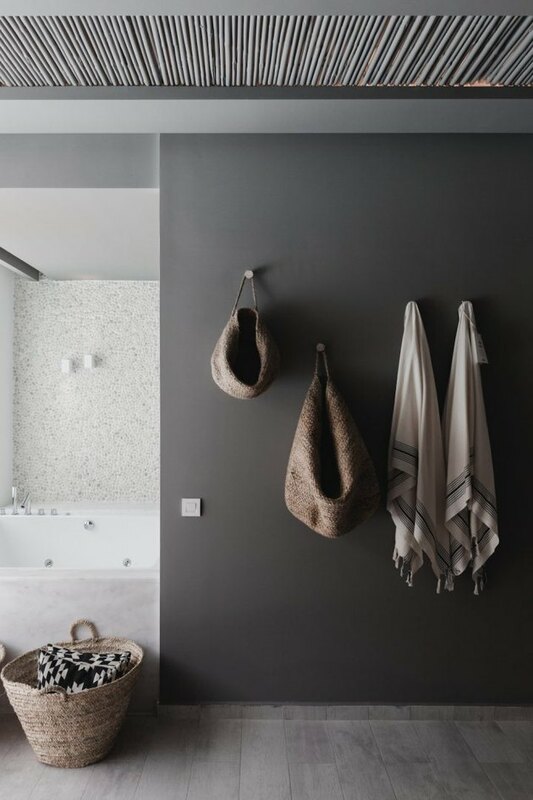 This minimal and dimly lit bathroom uses natural textures and moody gray hues that work together to realize a laid-back bohemian style bath. Inspired by Greek island architecture, designer Annabell Kutucu did a masterful job creating a 'down-to-earth design' reminiscent of a beach hideaway perfect for washing the day away. 13. Accentuate your gorgeous gray with natural light. 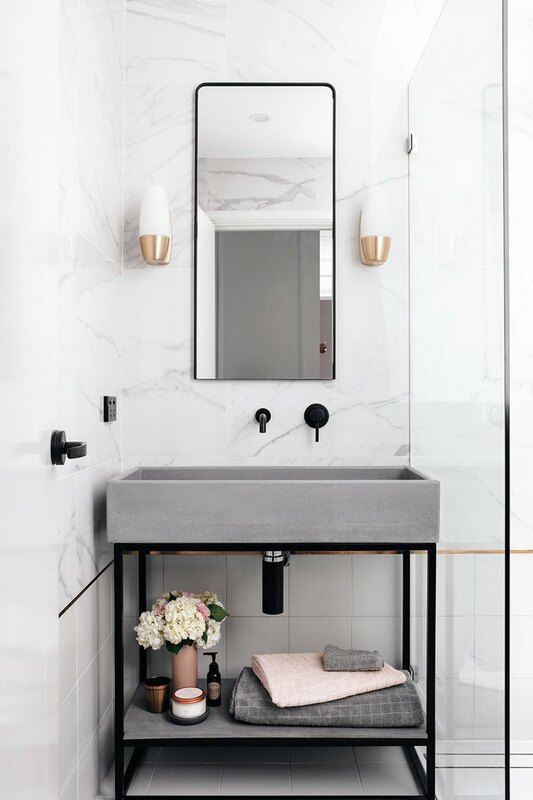 We love the composition of this bathroom designed by Cleo Design. 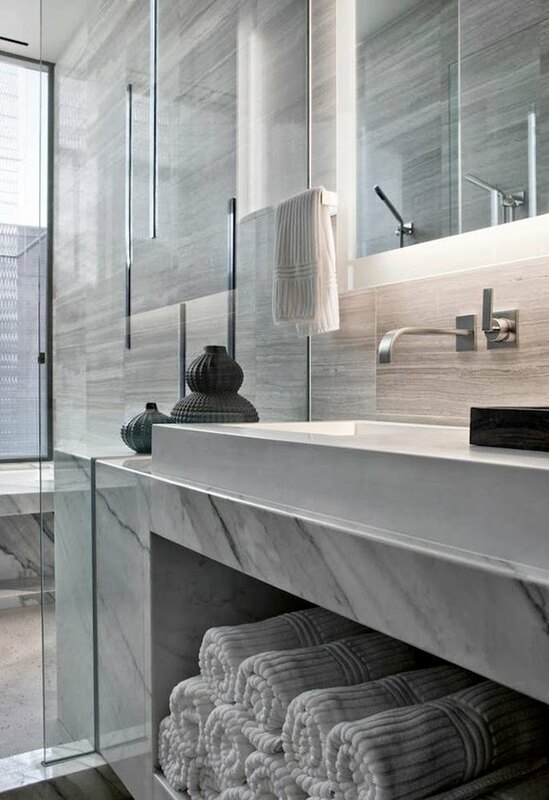 The strong, clean lines pair nicely with sleek polished chrome fixtures, while the oversized window allows natural light to come pouring in, accentuating the natural beauty of the gorgeous stone.